Forks on MTB’s are intricate and somewhat delicate devices that do a lot of work. If you had to think that your fork is probably the one device that soaks up all the hits from bumps, rocks, roots and everything else the trail or off-road presents. Sure on a dual suspension bike you have a rear shock and your tyres will also absorb some of these hits but for the majority of the time your fork is first in the firing line. Have a look at this fork doing its job at 1/4 speed. The terrain does not look exceptionally rough and yet you can see how active the fork is. 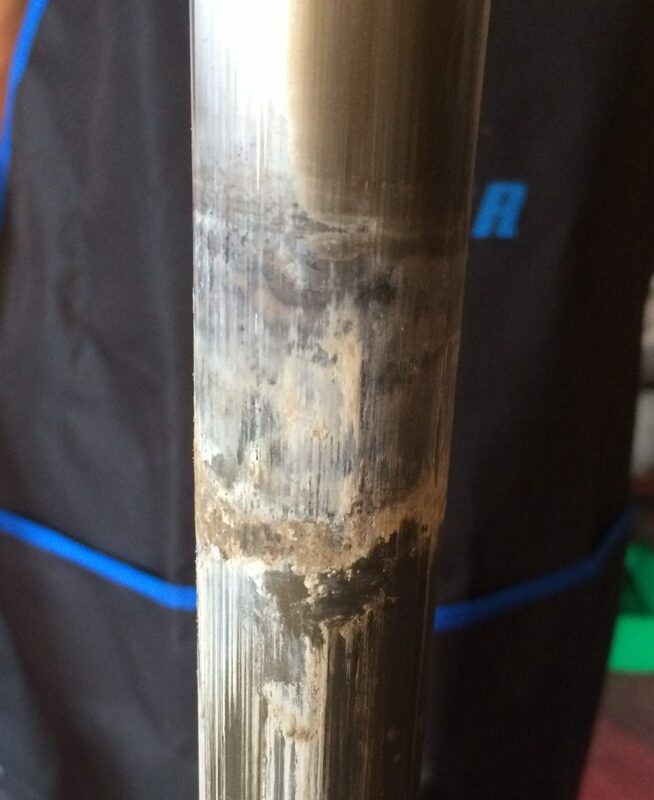 With this in mind as with most active mechanical and hydraulic devices your fork will need to be serviced to keep running smoothly and avoid damage. 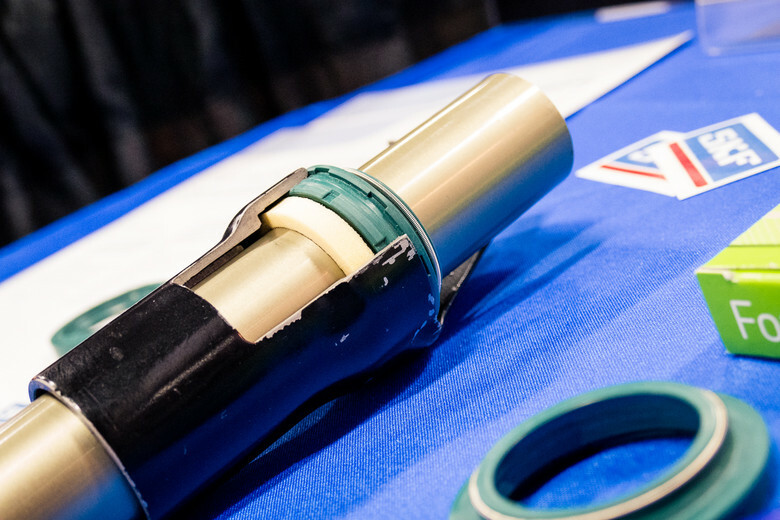 The most common type of damage is stanchion wear. Sometimes a bit of a silent killer as you cannot see the signs of damage below the seals and stanchions. They can wear over time without you knowing that it’s happening unless you pay close attention to them when washing your bike. 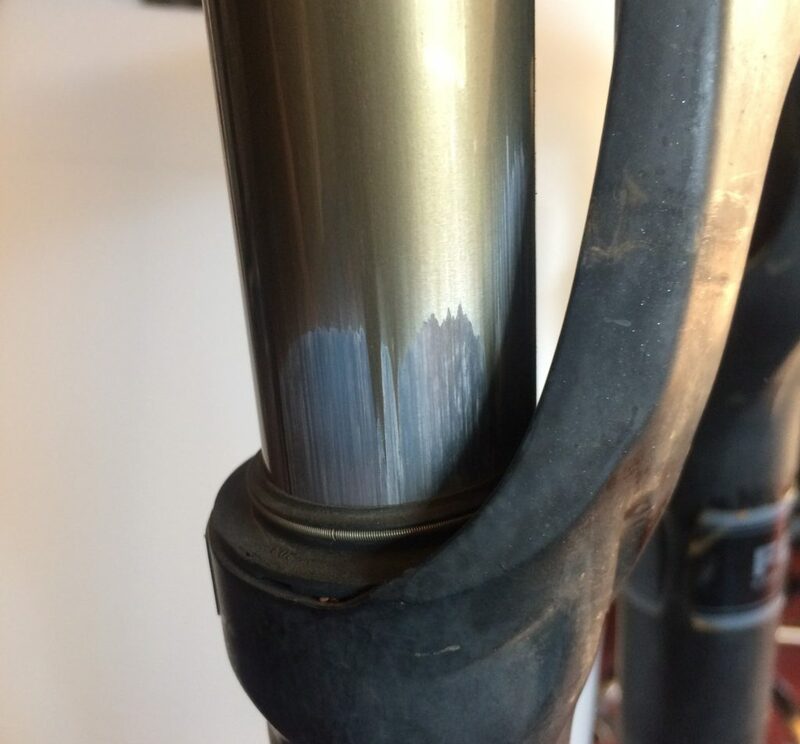 For those who don’t know stanchions are the smooth tubes connected to your fork crown. They are mainly stationary while the lower legs of the fork move up and down over them. 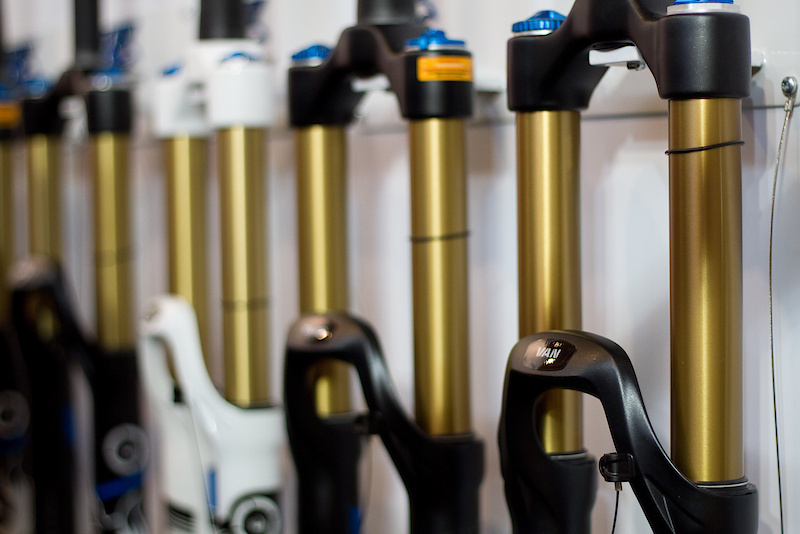 They come in different coatings for example FOX uses Kashima with a golden colour on their factory series. Stanchion sizes range from 32mm to 40mm. Your typical cross country bike uses 32mm stanchions. If you are interested in more fork jargon check out this thread on Bike Hub. So what does stanchion wear look like? Visible stanchion wear above the dust wiper/seals. As you can see there is clearly visible damage to the coating and it has even penetrated the aluminium base of the stanchions. With the fork lowers off the real damage presents itself and it’s not pretty, ouch! Stanchions clearly damaged below the seals/wipers. So what causes stanchion wear? Your stanchions are protected from dirt and contaminants by your fork seals. 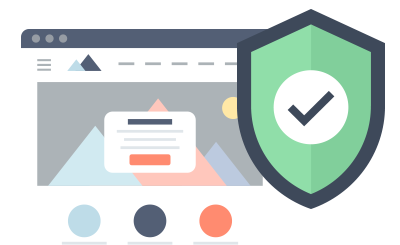 These seals serve two purposes. The bottom part keeps your suspension oil in the lower parts of the fork and prevents any contaminants from entering and contaminating your oil. The upper part acts as a dust wiper or scraper and will scrape away dust and mud on the stanchions. In addition you also have a foam ring that sits below the seal. The foam ring is there to keep a film of oil on the upper tube before it passes through the wiper to reduce friction and as a secondary trap for any foreign material that might have made is way past the dust wiper. This image shows some SKF seals sitting in the lowers. 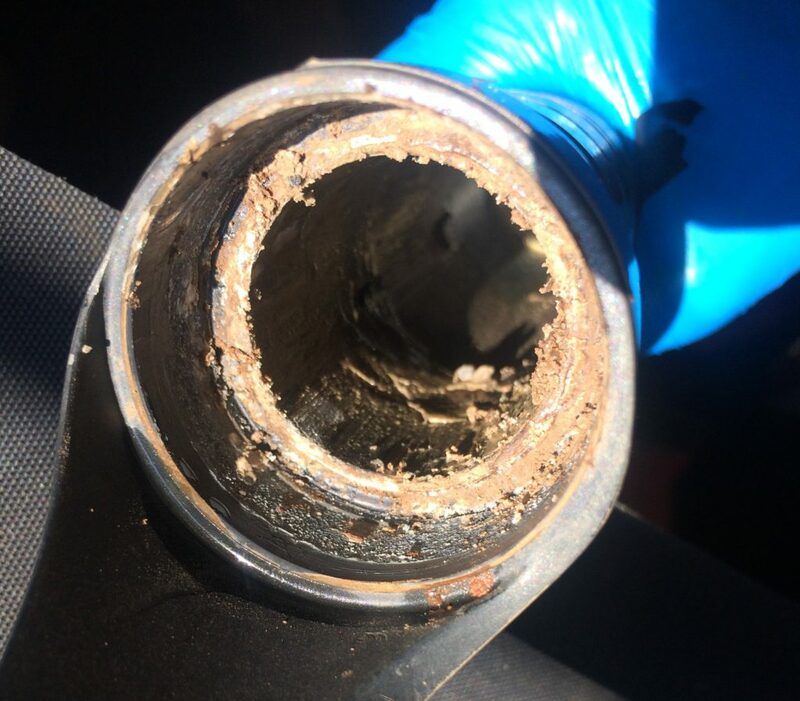 When dirt gets trapped inside the seals and wipers they will become a gritty abrasive paste and slowly start eating away at your stanchions. Furthermore it will move down to the lower parts where you have bushings that the stanchions glide against and start eating away at that too as well as contaminating your oil. A fork like this will need to have some major work do get it back to its former glory. This includes a new set of uppers and bushings replacement. A costly exercise! How do you avoid stanchion wear? Forks need servicing and a typical service would involve replacing the fork seals. FOX recommends that you service your lowers at least every 50-100 hours depending on your fork model and age. If your stanchions are already worn it might need servicing more frequently. Stick to the service intervals and look for visible damage when you wash your bike. Other signs might include oil wicking out of dust wipers. This usually means that the wiper has contamination between the wiper and upper tube. Bottom line: SERVICE YOUR FORK! DO NOT use a power washer to clean your stanchions. You will spray the dirt into the wipers! Adding a bit of suspension oil on your stanchions after a wash and then compressing your fork will help lift out dirt trapped in the wipers. Use quality seals like FOX Fork Seals or SKF Fork Seals both available in our online store. These seal kits contain the seals/wipers, foam rings and crush washers required for a service. You should also stick to the right oils as recommended by your manufacturer. Should you wish to attempt your own lowers service then check out this video we recently posted. If you have a problem with your stanchions or require assistance with fork servicing contact us and we will be happy to help.